The first Airbus A350-900 medium haul aircraft from Singapore Airlines has just landed in Adelaide this morning at 8:15AM after its inaugural flight from Singapore. The aircraft entered into service as SQ279 and it will depart Adelaide for Singapore today at 10:45AM as SQ278. 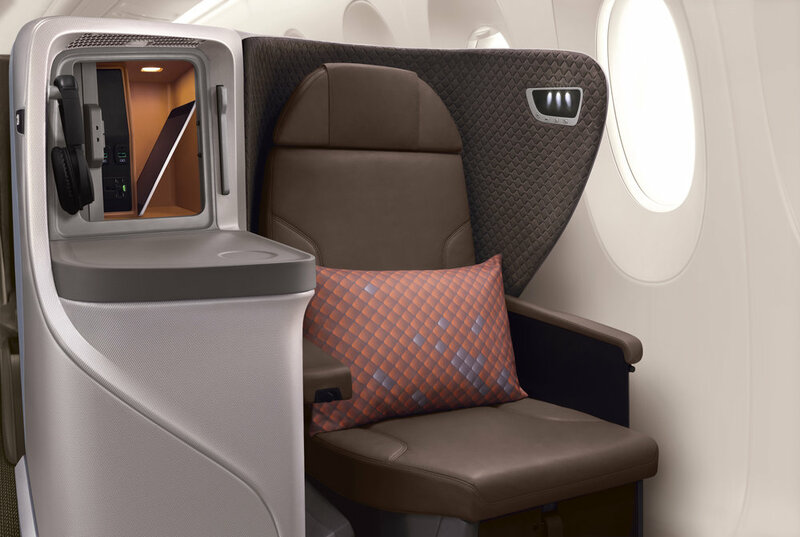 The A350-900 medium haul aircraft features the new regional Business Class and Economy Class cabin products that were recently launched on the airline's Boeing 787-10 Dreamliner fleet (check out the delivery flight of the first aircraft HERE!). This is also the first aircraft in the Singapore Airlines fleet to feature a Thales AVANT In-flight Entertainment System. Click HERE to get the best deals on flights! The A350-900 medium haul Business Class cabin has 40 seats that are arranged in a 1-2-1 arrangement to ensure direct aisle access for every passenger. Manufactured by Stella Aerospace, the new medium-haul Business Class seats allow passengers to recline directly into a 76" (approximately 193 cm) fully-flat bed and it even comes with retractable armrests that can be raised and lowered when required. Other features include (but not limited to) a business panel for in-seat power supply, an integrated reading light unit and a 17" full HD touchscreen monitor. The Economy Class cabin has 263 seats that are arranged in a 3-3-3 configuration. Manufactured by RECARO, the new Economy Class seats feature an ergonomically-designed contour backrest that provides greater relaxation - the six-way adjustable headrest with foldable wings provide great neck support. Economy Class passengers will also be able to enjoy an enhanced entertainment experience on their 11.6" full HD touchscreen monitor. The A350-900 features higher ceilings, larger windows as well as an extra wide body that delivers more space and comfort. Singapore Airlines has placed orders for a total of 67 Airbus A350-900 aircraft and 30 of which are already in the fleet - this includes 7 ULR variants, 21 long-hault variants and 2 medium-haul variants.